[AUTO](RC):When it boosts a rear-guard, put the top card of your deck face down as an equip gauge for the boosted unit. 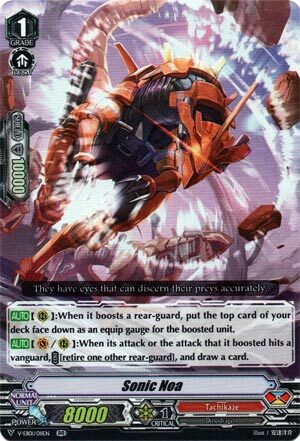 [AUTO](VC/RC):When its attack or the attack that it boosted hits a vanguard, COST [retire one other rear-guard], and draw a card. And this is how you get that Blightops set up. Or failing that just generate fuel for Savage King or something, if you’re one of those morons running it. Even without that though, the fact that the second skill could proc an already live Blightops without much effort needed on your part is already excellent. Sure, it doesn’t scale but that’s more the fault of the Grade 2s than anything else, and any on-hit pressure is nice…even if the opponent would guard the piss-easy ones anyway.